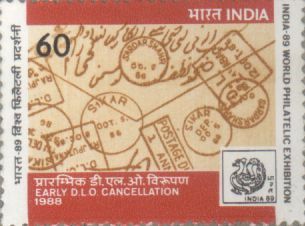 As a prelude to India-89, World Philatelic Exhibition, the Department of Posts issued a series of stamps. The fourth set issued, carries two cancellations, one of the RMS (Railway Mail Service) and the other of the DLO (Dead Letter Office). The Indian Postal System is one of the largest in the world. In the nineteenth century, the geographical area covered by the system was very much larger. 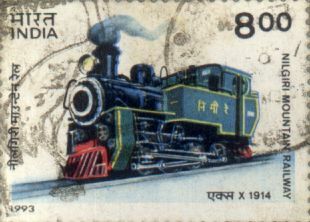 It included undivided India and Burma and also certain out-post of the British Empire like Aden, Singapore and Shangai where Indian Stamps were used. This, along with the multifarious activities undertaken by the system itself, made a study of the Indian postal history interesting as well as instructive for a philatelist specializing in postal history collections. 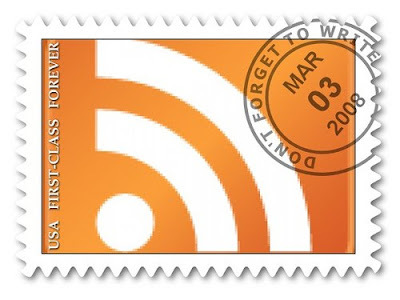 Postal history is the study of routes, rates and markings. The markings are by far the most colorful aspect of such collections. It was, therefore, appropriate that postal cancellations were chosen as the subject for these set of stamps. The first stamp depicts one of the earliest hand stamps of the traveling post office in the 'Allahabad-Cawnpore' railway sector and this postmark was in use from December 1864 to 1869. The traveling sorting offices between these two places used it. The first Traveling Post Office was established on 1st May 1864 under a Superintendent at Allahabad. The TPO operated on the 'Allahabad-Crownpore' and 'Calcutta-Delhi' railway sector. The circular postmark shown on the stamp has a diameter of 25 to 26 ms with 'TRAVELLING' along the upper rim of the circumference and 'POST OFFICE' along the lower rim, with No. 1 of the set, date and 'AC' in three horizontal lines in the space within the circle. This cancellation was used by the 1st set of the experimental TPO on 21st August 1864. 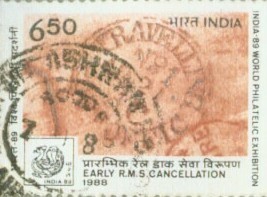 The second stamp depicts the type of cancellation used by the Dead Letter Offices in 1886. J.S Sett & C.R Headquarters. Jagannath Sunkersett was born on February 10, 1803, in a wealthy Murkute family of Daivadnya community. His father was a rich businessman and a landlord. Jagannath received his early education from private tutors and soon became fluent in Marathi, Gujarathi, Sanskrit and English. He wanted to see an all round development of Bombay. His initiative in this direction saw the setting up of the J.J.School of Art, The Prince Albert Museum and the Victoria Gardens. He was also instrumental in founding the Royal Asiatic Society. Visualizing the importance and requirement of faster means of bulk transportation in the future, Jagannath Sunkersett formed the first Bombay Steam Navigation Company. He also realized the need for the Railways. He formed the first Inland Railway Association, which persuaded the British to lay tracks from Bombay's Victoria Terminus to Thane. This later came to be known as the G.I.P. Railway. He was made one of its first Indian Directors. 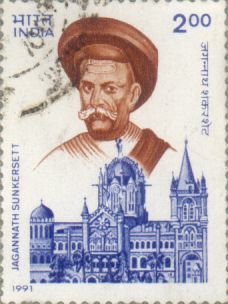 The stamp depicts Jagnnath Sunkershett along with the Headquarters of Central Railways symbolizing his efforts in the establishment of the first railway line in Bombay. Silver Jubilee National Rail Museum. 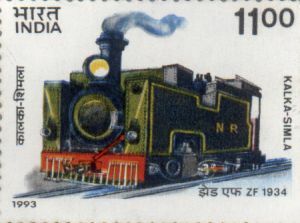 Indian Railways set up the National Rail Museum in 1971. The Museum displays, both in the indoor gallery and the open yard, a good sampling of the history of Indian Railways. It provides an excellent opportunity to research students, railway enthusiasts, philatelists and educational establishments to cover the whole era at one place. 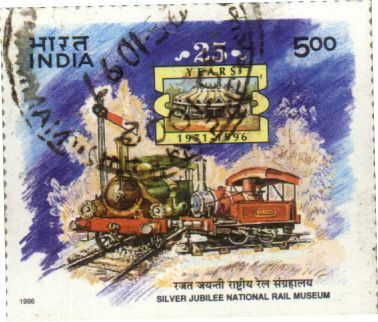 In connection with the Silver Jubilee of National Rail Museum a commemorative stamp of 500P was issued on 7 October 1996. 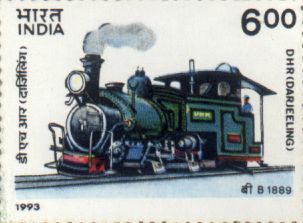 The stamp depicts the 145-year-old steam locomotive the 'Fairy Queen' and another steam locomotive Ramgotty built in 1862. Designers/Printers: Calcutta Security Printer Ltd. It was in 1882 that the first plans were made to link the picturesque western coast of India with a railway line. But the formidable Sahyadri mountains, the innumerable creeks and rivers proved too great a challenge at that time. The Railway System had begun just a few decades earlier. The first railway line on the Indian sub-continent, from Bori Bunder to Thane-a distance of 21 miles had been opened to traffic on April 16, 1853. Since then, it had grown to a total of 62,915 route kilometers. However on the western coastline of the country, there was a crucial missing link. In 1984 more than century after the first tentative survey, fresh plans were drawn up for a railway along this route. The survey was conduct over four years, up to 1988 and the Konkan Railway Corporation Ltd. (A Government of India Undertaking) was set up with Maharashtra, Goa, Karnataka and Kerala in 1990 under the Build Operate and Transfer (BOT) principle. It was a formidable task. The terrain through which the line transverse is the most difficult encountered in the history of railway construction. Crossing the route involved building 92 tunnels, 172 bridges,2819 minor bridges and 59 stations. Some tall viaducts were also needed to be built, such as the one on the Panval Nadi valley in Ratnagiri, the tallest bridge in Asia. The construction was finally completed on January 26,1998 in the golden jubilee year of Indian independence. Born on December 27,1897, and hailing from village Walawal in Kudal Tahsil of Sindhudurg District in Maharashtra , Shri Arjun Balwant Walawalkar joined Bombay, Baroda and Central India Railway (presently Western Railway) in its Drawing Department in 1922. He was the visionary who dreamt and conceived Konkan Railway Project and his detailed proposal was ready as far back as 1952 when he published a booklet entitled 'Konkan Railway Project'. While formulating the scheme, Shri Walawalkar undertook intensive and extensive tours in the Konkan Region and worked ceaselessly and tirelessly in propagating the scheme and enlisting popular support for it. He wrote a number of articles in the newspapers, organised conferences, seminars and exhibitions, called on the successive Railway Ministers and Chief Ministers of the concerned States. Even public ridicules and criticisms did not deter him from his dream project. On December 23,1970, Shri Walawalkar breathed his last but not before bringing his dream project within the realm of realization. Now his dream has come true as a broad gauge superfast link between Mumbai and Mangalore- Konkan Railway is the biggest new railway line construction undertaken on the Indian sub-continent in the present century. This 760km-long broad gauge line passes through the most difficult terrains and involves 180 major bridges, over 1600 minor bridges and tunneling for a total length of 84 kms. 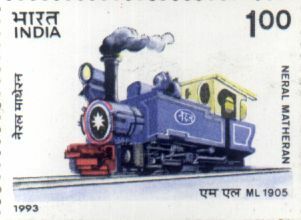 The project took a little over seven years and was commissioned on January 26, 1998 The Department of Posts, Ministry of Communications, released a commemorative postage stamp in honour of late Shri Arjun Balwant Walawalkar, who has been described as 'father of the Konkan Railway Project'.